In the boxes: Rice, minced chicken balls with teriyaki sauce, sweet peas & grapes. Simple decor for my boy's bento, as his mommy was too lazy to think of what to do. 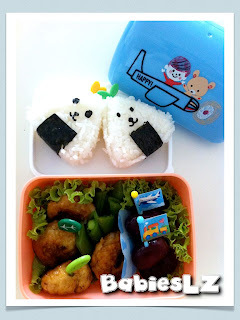 I would have just put everything into the lunch box but I knew he preferred to have a little decor for his bento. 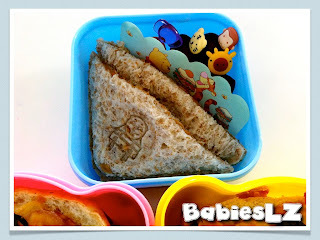 Yes, my 老二 likes to have 'cute' bento. He often told me his friends would crowd around to see what's in the box, especially the girls. Little one loves to sing lately. Sometimes, I know he tries to sing twinkle twinkle little star but other times, I have no idea what it is. Nevertheless, I love to hear him sings! We were invited to sit in for L's Ballet mock exam and I was so happy to see my gal dance. Hmmm.. She doesn't seem confident this time, hopefully she will do well for the coming exam. Here's some parts of the exam. Terrible me! I forgot all about Beanie's checkup for 2 yr old and jabs too! 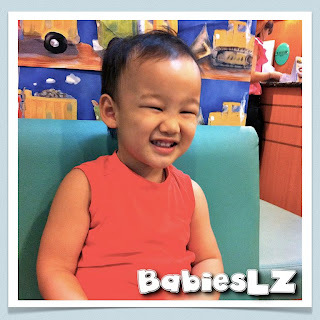 Everything is fine with him, he's growing well and is still on the 90 percentile. 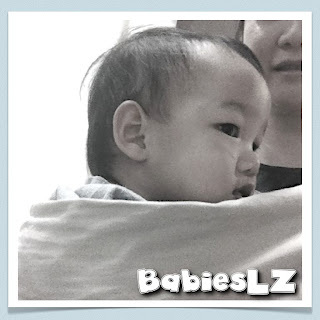 My brave little boy frown a little when he was given jabs. 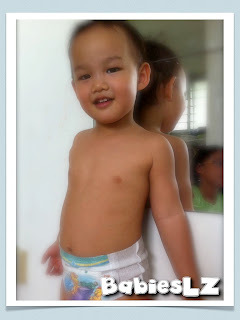 Now that he is 2 yr old, I have started sending him to his naughty corner. For instance, once he hit his brother because he was angry, I sent him to the corner. I explained to him what did he was wrong. After 2 mins, I asked him what did he do wrong. He told me "bean bean beat gorgor." He knew he can only come out of his naughty corner when he admit that he was wrong. I told him to apologise to Z and hug him. He did as he was told. It was not tough to teach him what's a naughty corner. When he was sent to the naughty corner for the for the first time, I told him what he did was wrong, that's why mommy sent him there to 'reflect' (I used simple words to explain to him). He didn't come out of the corner at all! I was surprised! Since then, I have no problem using the naughty corner for him. I would say he is one that takes instructions well, not only at home in school as well (that's what the teachers told me). Remember my little one likes to doodle? This afternoon he drew this! And he said "Mama, Look! Apple!" Proud of him! 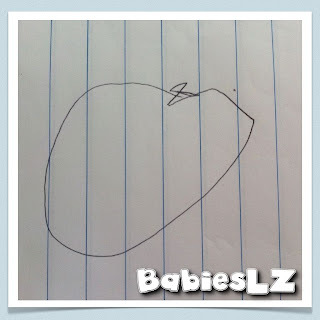 At 2 yr old, he drew this and able to tell me what it was! 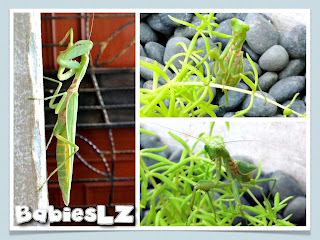 He is getting heavier each day.... I'm gonna miss carrying him in the carrier.. Love the way he 'hide' himself and wants me to cuddle him as we walk. 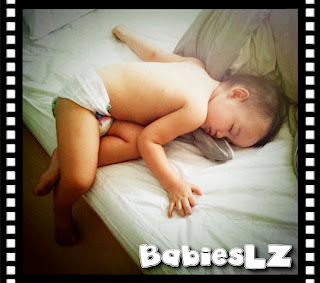 ♥ Little one is able to relate to me what happen to him. 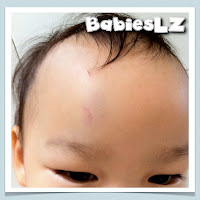 For instance, the other day (5 Mar) he knocked his head and he told me "mama, bean bean pain knock." It may not be a complete sentence but that's a good start. 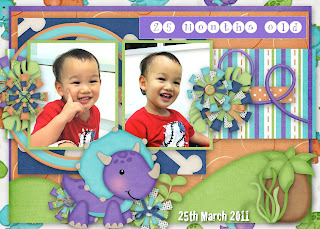 ♥ He's beginning to say more 2 syllabus words now, the new word is 'Percy'. 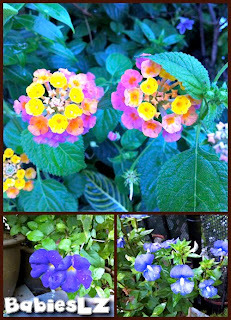 ♥ He was down with flu & cough on 7th March. Surprisingly, he is willing take medicine! I'm very happy that I do not have to 'force' him anymore. ♥ He puts on training pants for the FIRST time on 12 March. 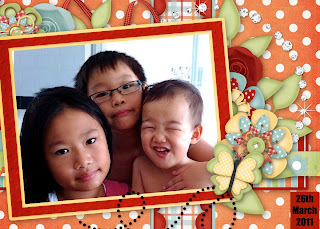 Not too bad for the first day, he peed in school toilet and for that past few days, he peed in the toilet at home. Not sure if he's ready coz he doesn't tell me. Every hour or so I ask him. He managed to stay dry for quite a while and only wet it when he's napping. His FIRST Badge This Year! Last year, Z got all the 4 badges from school. This year, he strives to do the same too. 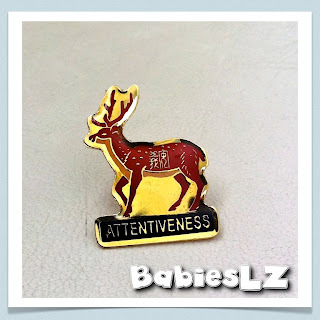 This is the FIRST badge he got for term 1! Well done my boy! I'm sure you can do it! 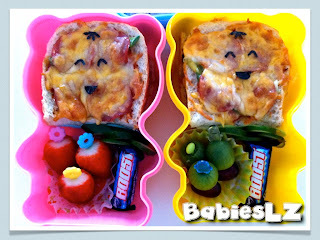 In the boxes: Foccasia bread pizza, strawberries, mini kiwis, grapes & chocolates. 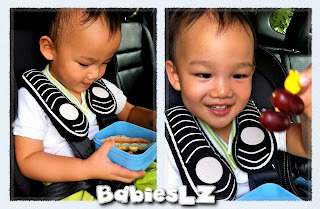 Beanie had his bento in the car after school. Now that the National Water Safety Council changed the test system, L had to take the bronze award again! Agggrrrhhh.... She should be going for gold! She was so upset & angry that she had to go through it again! 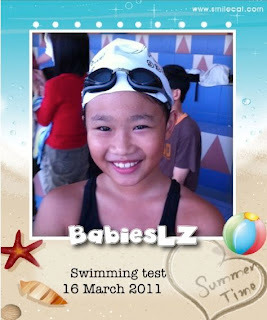 Some of her swimming friends already got the gold and had to take the test again too. There are 6 stages now, you can read about it HERE. - Search for and recover an object in 1.5 m of water depth. Demonstrate a feet-first surface dive. My princess was only a little nervous but with some of friends chatting & giggling with her, she soon forgot about it. The tester did not test them on everything that was stated above, he probably knew the group of them were either gold or silver swimmers. Before the test ends, he asked them questions with regards to water safety (which was compulsory). After that, he told all of them they passed the test. Yay! My girl passed her Bronze award (again)! Well done my girl! Mommy is proud of you! Caught him sleeping in another position again!